The Salad Sac is a revolutionary product that keeps your salad and veggies fresh, every time! No one wants a wilted salad or the hassle of preparing one every day. If you find yourself relating, then The Salad Sac is for you! It provides an easy way to freshly store your salads. Just wash your lettuce and veggies, toss them in the Salad Sac, and refrigerate. It's that simple! • No more brown and wilted salads to throw away! • Make extra salad ahead of time to last a few days for many servings. •Keep your Salad Sac handy with kitchen towels. Launder new Salad Sac before using and use only for salads and vegetables. • Wash and prepare lettuce and vegetables as usual for salad. Almost any vegetable can be used (except chopped onions & mushrooms - add these when serving salad). • Put wet lettuce and chopped vegetables directly into the Salad Sac (Do Not use lettuce spinner or paper towels). • Gently pat and shake for a few seconds so that excess water starts absorbing into the Salad Sac . • Store in any convenient spot in the fridge until serving time. • Once served, any leftover salad (without dressing) can be returned to the damp Salad Sac and kept in fridge for the next day or even longer. The Many Uses Of The Salad Sac! The Salad Sac is not just for salad...it's great for storing all your fresh vegetables! Just wash whole heads of lettuce and veggies and place them in the Salad Sac! It's ideal for any kind of veggie including celery, broccoli, cauliflower, spinach, fresh herbs, parsley, dill, and more! Our Salad Sac is made of a special grade of “super absorbent” 100% cotton, designed specially for food allowing for the “ ultimate” freshness of lettuce, vegetables and salad. It's so easy! Just place washed lettuce and veggies in the Salad Sac , put in the fridge and that's it! The Salad Sac will do the rest by absorbing excess water, staying very damp, actually keeping your lettuce and vegetables alive and very fresh and crisp. 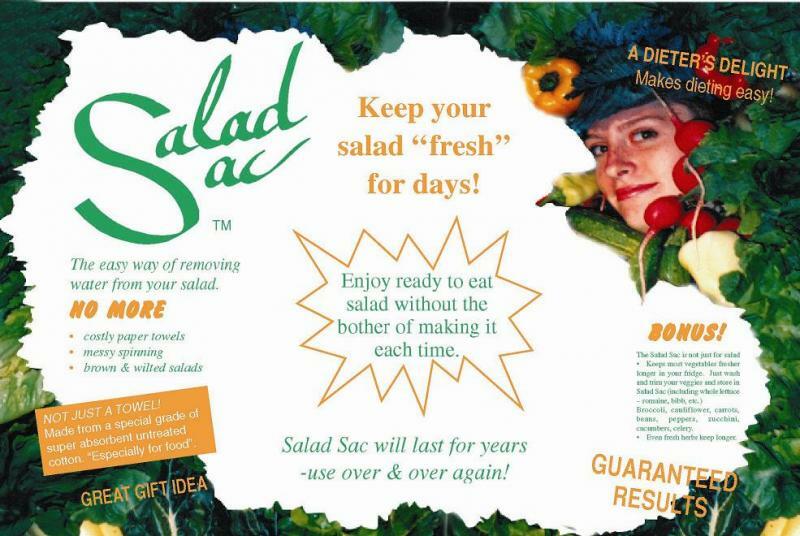 The Salad Sac will last for years and is very easy to maintain. Just throw in the wash with kitchen towels and toss in the dryer (No fabric softener please). That's it. Plus, it takes up very little storage space. Every household should have at least 2 or 3 -- one for salads, one for veggies, and an extra Salad Sac, when others are in the laundry. A salad will stay fresh and very crisp for approximately 3-5 days. This means that you can make salad, store it in the fridge and it's ready to eat whenever you want! Iceberg lettuce stays fresh longer when washed and kept whole. Whole heads of washed romaine lettuce will stay fresh for up to 10 days.